Many years ago, I started work with iptables, the Linux-based firewall software. At the time, documentation was sparse, and the details about what happens to a packet during processing were hard to figure out. Since then, documentation has improved, but I always wished there was a visualization that I could quickly use to trace a packet (observed or theoretical) through the various tables and chains. While creating content for SANS FOR572, Advanced Network Forensics: Threat Hunting, Analysis, and Incident Response, I decided to create a flowchart myself. Since I find it most useful in color, I’ve provided the document here. 2018-11-14: Reflects that outbound interface is determined by routing decision, not iptables. 2018-09-01: Reflects that localhost-sourced/destined packets will not traverse the nat table’s PREROUTING/POSTROUTING chains, respectively. Thanks to commenter Binarus for the pointer. 2017-03-30: Thanks to commenter Eike for noting that some terminology with the outbound interface selection was unclear. 2017-02-01: Thanks to commenter arm for noting that newer kernels also provide a NAT|input chain. 2016-11-18: Thanks to commenter Andrey for pointing out an error, which has been corrected. I’ve also adjusted the arrangement and cleaned up the logic a bit in this version. I hope you find the document useful. If you have any input to make it better, please let me know. 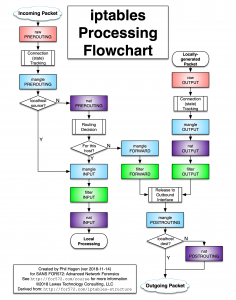 26 Responses to "iptables Processing Flowchart"
The flowchart says “Derived from http://for572.com/iptables-sructure“, but this link is broken. This has been a problem for a while now – the site was taken down without explanation. However, I’ve just pulled a mirror from the Wayback Machine and hosted it myself. The short link has been updated (note the link is actually for572.com/iptables-structure). Thanks for the nudge to finally check this off the proverbial “to-do” list! I just came to say. Thanks a lot for the helpful flowchart. I always thought you would design the flow chart first then make the software – not the other way round. Then again what do I know. Glad you finally got round to making this. A fair statement – I’m of the same mindset! Hi I try policy based routing and made one fwmark in filter FORWARD, after some ACCEPT and DENY in my firewall. Via ip rule matching this fwmark I try to make a routing decission. I can see that the fwmark is set and the rule is correct, but never used. So I think there is no routing decision after filter FORARD. If I set my fwmark in mangle PRERPOUTING it works. I included that block and specified it was an “INTERFACE Routing Decision”, meaning the system determines what the output interface will be, but doesn’t make a full routing calculation. This interface determination is important, because the POSTROUTING chains will have access to the outgoing interface name for the “-o” flag in iptables. I’ll update this to reflect that it’s an interface determination, not a routing decision, though. Give me a few minutes to update and publish. Thanks for the observation and feedback! The ruleset filter.FORWARD permits tests of the outbound interface (-o … ) as well as the inbound interface. The choice of output interface cannot therefore follow filter.FORWARD. Ah – that’s an interesting nuance. The outbound interface is initially identified during the “Routing Decision” step. This is what’s used during the -o evaluation on the filter.FORWARD chain. However, since the packet is not released to an interface until after the various *.OUTPUT rules have been handled. I absolutely understand where the confusion comes from here and agree that perhaps the wording on “Outbound Interface Assignment” could be clearer – perhaps “Release to outbound interface”. I did try to mirror the upstream iptables documentation as closely as possible, though. I’ll flag this for clarification in the next update – thank you for pointing it out! Right after the locally-generated-packet and before the raw-output, I think there should be a routing-decision. I don’t believe so but I’m looking into a few resources on this. The routing decision is made down the processing pipeline in the “Interface Routing Decision” box. I’m quite sure that the iptables/netfilter processing is all done before that step. It seems you are missing the nat INPUT chain. Also, you are not showing a path for local packets with local destinations to take, which traverse OUTPUT and then INPUT. Great catch on the NAT/INPUT chain. It seems this was not present in CentOS prior to version 7 (possibly 6 – don’t have a system to test at this moment). I’ll get all of the details on the placement within the flowchart nailed down and post an update here when it’s ready. With regard to the local destinations, that’s not something I’d want to address in the chart itself, as it’s just a path from “Outgoing packet” to “Incoming packet” that doesn’t happen to leave the system’s memory. Thanks for the great call on NAT/INPUT! Thank you very much for that useful chart which helped me a lot and is the most accurate and up-to-date one I could find so far. However, I think there is still an error. In response to zrm’s comment, you have stated that packets originating from and destined for the local machine (i.e. looped back packets) just travel the output chain first, then the input chain, and that you therefore don’t want to treat this subject explicitly in the graph. As far as I can tell, this is not correct. Many years ago, I had problems with understanding some test results and therefore posted a message at the netfilter mailing list. The answer from Pascal Hambourg clearly stated that locally generated packets do not pass the nat PREROUTING chain, for example. This means that packets which are generated locally and absorbed locally do *not* run through all input changes (and eventually not even through all output changes, but I don’t know for sure). Therefore, I would be very grateful if you could update the graph so that it correctly reflects how purely internal packets are flowing. Please note that I might be wrong since it is 8 years later now. On the other hand, I strongly doubt that they have changed this because it just makes sense. OK – updated on the page and download link. Thank you again! Well, do not use it as a generic flowchart. It has two mistakes when compared to the source it was derived from. Hello, Andrey – can you let me know what the errors are? This is based on a number of sources, and I believe it to be correct. However, if there are errors, I would very much like to fix them right away. 1. 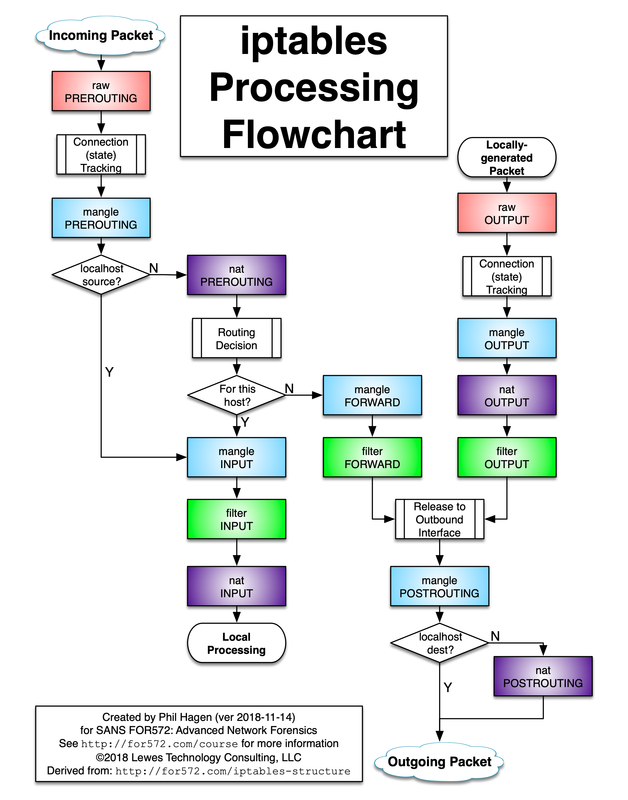 ‘filter FORWARD’ and ‘filter OUTPUT’ should merge not at ‘mangle POSTROUTING’, but at ‘routing decision’ (that is incorrectly placed between ‘nat OUTPUT’ and ‘filter OUTPUT’). 2. branching ‘For this host?’ is also a routing decision (or routing decision should precede it) . Thanks for the update, Andrey. Great catch on the logic bug – fixed. I’ve also adjusted the logic flow a bit to (hopefully) be more coherent and straightforward. Thank you, is really useful.